2015 Harmand Geoffroy Gevrey Chambertin 1er Lavaux St Jacques - $119.99: Vins Rare, The finest selection of rare wines. "A discreet application of wood sets off the cool essence of black raspberry, humus, forest floor and game nuances. There is first-rate punch to the even more intensely mineral-inflected medium-bodied flavors that possess excellent underlying material along with a very firm and presently prominent tannic spine that makes its presence felt on the hugely long finish. This is terrific provided you have the patience to allow it the considerable time it will require to soften as well as to add some supplemental depth." "One of the very finest examples of Lavaux St. Jacques is unequivocally the bottling from Domaine Harmand-Geoffroy and the 2015 will be a stellar wine with a bit of bottle age. The bouquet is deep, pure and very precise, wafting from the glass in a mix of black cherries, sweet dark berries, espresso, raw cocoa, grilled meats, black minerality and a well-judged base of cedary wood. On the palate the palate the wine is full-bodied, intense and impeccably balanced, with outstanding depth at the sappy core, great soil signature, suave tannins and a very long, tangy and still quite primary finish. Just add time in the cellar!" 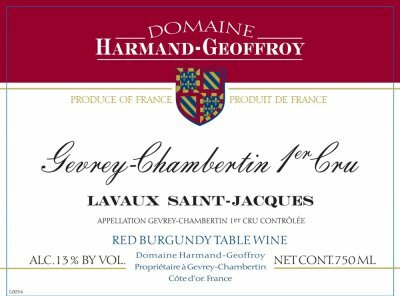 "The 2015 Gevrey-Chambertin 1er Cru Lavaux Saint-Jacques, which derives from no fewer than six parcels within this highly morcelated vineyard, reveals aromas of creamy red and black fruit, pencil shavings, wood smoke and a framing of spicy new oak. On the palate, the wine is medium to full-bodied, nicely concentrated and cool, with firm tannins asserting themselves on the finish and lending this a somewhat rustic character. This should develop well in the cellar, but my preference is for the Perrière and Champeaux this year."